The ozone-depleting gas N2O is an intermediate in denitrification, the biological reduction of NO3– to the gaseous products N2O and N2 gas. The molar ratio of N2O produced (N2O/N2O+N2) varies temporally and spatially, and in some soils N2O may be the dominant end product of denitrification. The fraction of NO3–-N emitted as N2O may be due at least in part to the abundance and activity of denitrifying bacteria which possess N2O reductase. 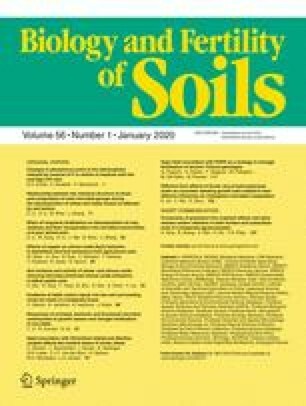 In this study, we enumerated NO3–-reducing and denitrifying bacteria, and compared and contrasted collections of denitrifying bacteria isolated from two agricultural soils, one (Auxonne, soil A) with N2O as the dominant product of denitrification, the other (Châlons, soil C) with N2 gas as the dominant product. Isolates were tested for the ability to reduce N2O, and the presence of the N2O reductase (nosZ)-like gene was evaluated by polymerase chain reaction (PCR) using specific primers coupled with DNA hybridization using a specific probe. The diversity and phylogenetic relationships of members of the collections were established by PCR/restriction fragment length polymorphism of 16s rDNA. The two soils had similar numbers of bacteria which used NO3– as a terminal electron acceptor anaerobically. However, the soil A had many more denitrifiers which reduced NO3– to gaseous products (N2O or N2) than did soil C. Collections of 258 and 281 bacteria able to grow anaerobically in the presence of NO3– were isolated from soil A and soil C, respectively. These two collections contained 66 and 12 denitrifying isolates, respectively, the others reducing NO3– only as far as NO2–. The presence of nosZ sequences was generally a poor predictor of N2O reducing ability: there was agreement between the occurrence of nosZ sequences and the N2O reducing ability for only 42% of the isolates; 35% of the isolates (found exclusively in soil A) without detectable nosZ sequences reduced N2O whereas 21% of the isolates carrying nosZ sequences did not reduce this gas under our assay conditions. Twenty-eight different 16S rDNA restriction patterns (using two restriction endonucleases) were distinguished among the 78 denitrifying isolates. Two types of patterns appeared to be common to both soils. Twenty-three and three types of patterns were found exclusively among bacteria isolated from soils A and C, respectively. The specific composition of denitrifying communities appeared to be different between the two soils studied. This may partly explain the differences in the behaviour of the soils concerning N2O reduction during denitrification.